Window graphics are any type of graphic applied to an interior or exterior window surface. These graphics require the use of an optically clear mounting adhesive. Optically clear adhesives offer a completely transparent appearance that won’t diminish the look of the graphic when it is viewed through a window. D&K optically clear mounting adhesives also feature UV inhibitors to help protect against graphic fading caused by exposure to sunlight. Window graphics are mounted in a two step process: first, apply the permanent side of an optically clear mounting adhesive to the face of a print, then remove the release liner protecting the second adhesive side and apply this to the glass. For the ultimate high-end window graphic, use a two sided image that can be viewed from the front and back. Adding a laminating film to the back of the graphic can also offer added rigidity to assist during installation and help protect and enhance the inside viewing surface. Most optically clear window graphic are applied to the window using a wetting agent and a squeegee. A wetting agent can be a simple soap and water mixture or a professional window mounting solution. This is lightly sprayed on the window before placing the graphic in position. The wetting agent allows the installer to reposition the graphic without it bonding to the window. A squeegee or similar object is then used to push the solution out from behind the graphic to smooth down any trapped air pockets and adhere the graphic to the window. D&K’s Brilliance Window Adhesive offers a unique egress liner system that creates air escape channels in the adhesive. Bubble-free graphics can be applied by inexperienced users without the need for a wetting agent, as the air escape channels allow bubbles to get squeegeed out from between the graphic and window. Expression® Optically Clear Permanent Adhesive – OC product codes. Optistick Permanent Adhesive – OSP product codes. Expression® Optically Clear Removable Adhesive – OCR product codes*. Optistick Removable Adhesive – OSR product codes*. Brilliance® Window Adhesive – EOCR product codes. 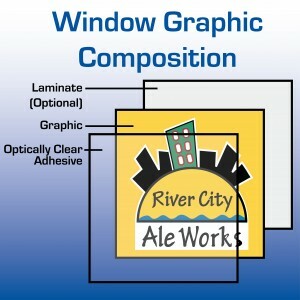 *These products are also recommended for permanent or long-term window graphic applications. The removable adhesive will remain firmly in place on windows, acrylic, and similar surfaces until intentionally removed. A removable adhesive also allows graphic shops to repurpose acrylic and other substrates without damage or requiring extensive cleaning.